Hello there! I don't know about over in your neck of the woods, but here in Indiana it's been raining cats and dogs for the past couple of weeks. 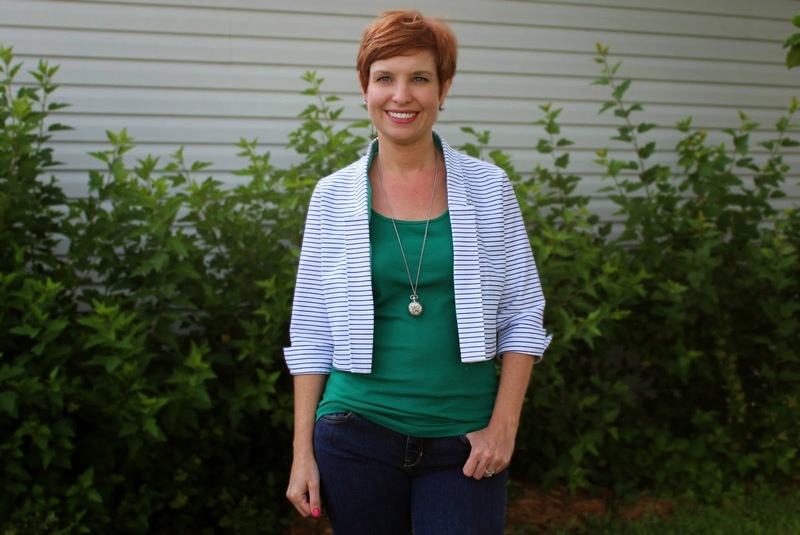 I've been anxiously waiting for the weather to let up so I could get pictures of my next make for the Fabricista blog, The Victoria Blazer. The pattern is By Hand London's Victoria Blazer that was released last year in their Spring/Summer collection. 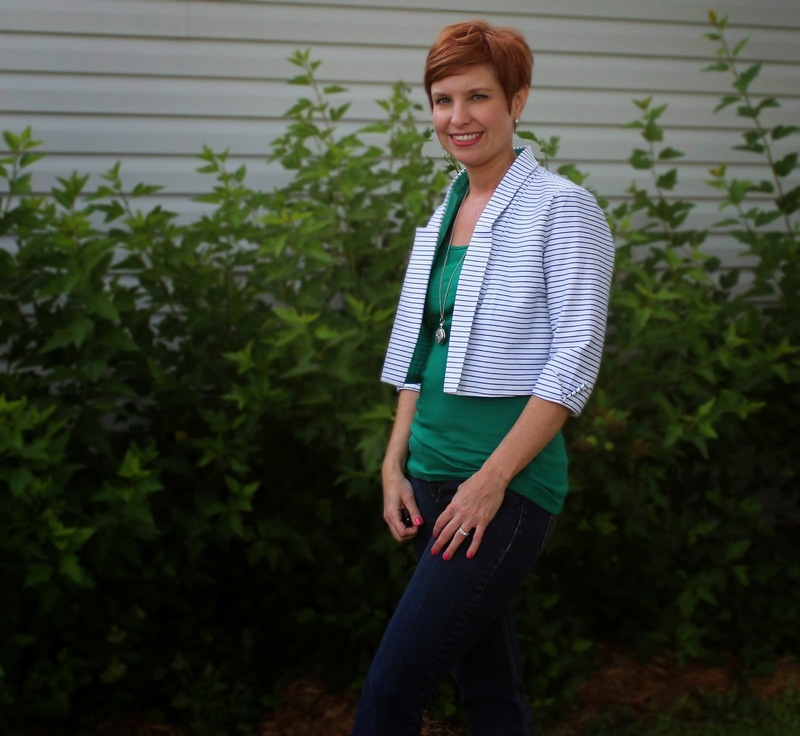 It's a casual blazer with 3/4 length sleeves that have french seamed cuffs so you can wear them up or down. The jacket variations are full length, cropped and sleeveless. The design is casual and laid back so there is a generous amount of ease which makes for a very easy fit. #1 - Stretch...The fabric had absolutely no give on the crosswise grain. Stretch would of been a big contender if the jacket style was more fitted but it's not so I wasn't worried. Ok let's get down to the nitty gritty, fitting and construction! Again because of the oversized fit of the jacket I was convinced fitting would be a breeze. Still though I made a muslin to be sure. The shoulder seams drooped a little too far past my shoulders for my liking. I shortened those by 1/2 inch. I also had to shorten the sleeves by 2 inches...I have some short arms. The pattern instructions/illustrations were very clear and easy to follow. BHL also has a sew-along over on their website if your like me and need a little extra hand holding. Hey nothing wrong with that! When I arrived to the point where the jacket shell was completely assembled I seen where cutting on the crosswise grain was affecting the drape. You can see in the picture below how the back balloons out A LOT. To correct this I added two back darts, 6 inches in length and 1 in wide. The blazer has a partial lining. 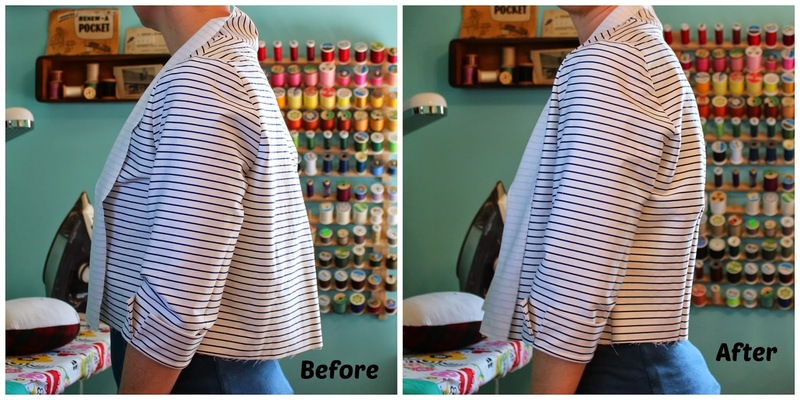 The sleeves are not lined and the lining is left unattached at the sleeves. 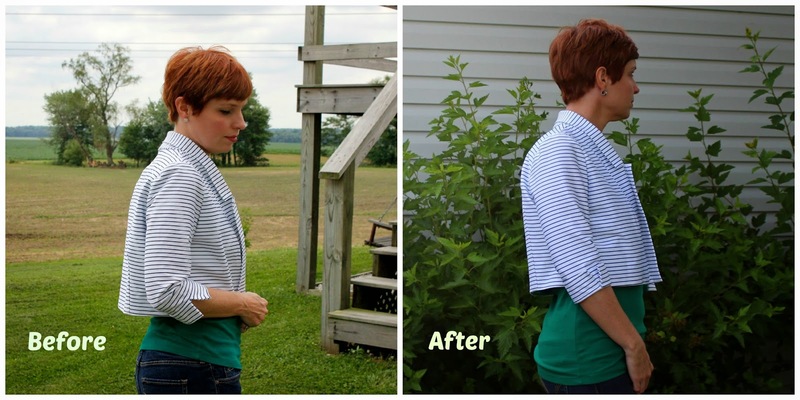 I found this kind of odd so I followed a few other bloggers and attached my sleeve lining to the sleeve seams. 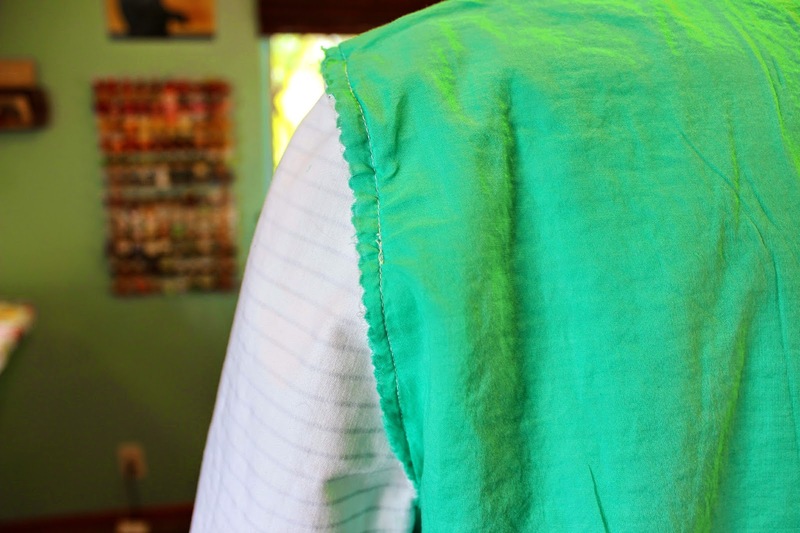 This also helps to keep the lining from sagging and peeking out at the bottom hem. You can see below how I attached the lining to the sleeve. This picture was after I washed the blazer so my pinked seams weren't as pretty and ironed flat as they once were but you get the idea. My lining was a lightweight cotton poplin from my stash. This blazer came together pretty quickly. I worked on it for an hour or two each evening after work and had it completed by the weekend. If casual and laid back is your style then this pattern has your name written all over it. I'm more of a fitted jacket kind of gal however with my shoulder/sleeve alterations and the body of my fabric I think I found a nice balance between the two. I would/will make this pattern again and opt for the full length style. I love how cool and chic Victoria herself looks in the vest styled over a cute little black dress.